Definition at line 376 of file LLVMContextImpl.h. Definition at line 384 of file LLVMContextImpl.h. Definition at line 388 of file LLVMContextImpl.h. Definition at line 400 of file LLVMContextImpl.h. Definition at line 392 of file LLVMContextImpl.h. 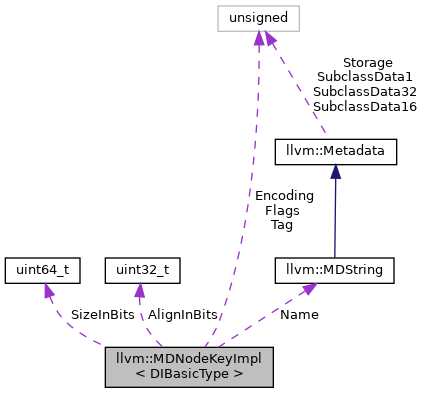 References llvm::DIType::getAlignInBits(), llvm::DIBasicType::getEncoding(), llvm::DIType::getFlags(), llvm::DIType::getRawName(), llvm::DIType::getSizeInBits(), and llvm::DINode::getTag(). Definition at line 380 of file LLVMContextImpl.h. Definition at line 381 of file LLVMContextImpl.h. Definition at line 382 of file LLVMContextImpl.h. Definition at line 378 of file LLVMContextImpl.h. Definition at line 379 of file LLVMContextImpl.h. Definition at line 377 of file LLVMContextImpl.h.